Reprint. Originally published: UK: Michael Joseph, 2015. 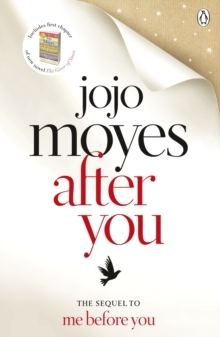 The perfect gift for your Mum this Mother's Day, After You is a beautiful love story that will make you both laugh and cry. . . 'Matches Me Before You. Funny, sad and wise, you'll be using a hankie as a bookmark' Mail on SundayLou Clark has lots of questions . . . Like how it is she's ended up working in an airport bar, spending every shift watching other people jet off to new places. Or why the flat she's owned for a year still doesn't feel like home. Whether her close-knit family can forgive her for what she did eighteen months ago. And will she ever get over the love of her life. What Lou does know for certain is that something has to change. Then, one night, it does. But does the stranger on her doorstep hold the answers Lou is searching for - or just more questions?Close the door and life continues: simple, ordered, safe. Open it and she risks everything. But Lou once made a promise to live. And if she's going to keep it, she has to invite them in . . . If you loved After You, discover where the love story began in Me Before You, and find out what Lou Clark does next in Still Me - out now! __________'This beautiful story is perfect. Will have you brimming with tears and grinning in equal measure. L-O-V-E' Closer'Moyes totally delivers. With its twisty plot, characters you fall in love with, weepy bits and witty bits, this is pretty much perfect' Glamour 'Wonderfully warm. Moyes manages to break your heart before restoring your faith in love. Unputdownable' Sunday Express'Classic Jojo - fans will love it' Heat'Satisfyingly brilliant' Sun'I read this in one sitting.